I had been told about the possibility of going by land from French Guyana to Belem and decided that would be the way I’d get to Brazil. I started Sunday afternoon in a very quiet Cayenne and learned I had missed the last bus to St. Georges, the border town of French Guyana and Brazil. Instead, I had to hitchhike, and waited on the side of the road for only a few minutes before a Lexus SUV pulled over. The driver was Cecil, an immigration officer who worked in St. Georges. We drove the 3 hours together listening to Zouk, and only stopped once to buy a bag of lychees for 1 euro on the side of the road. He told me about all the tricks and formalities I had to know to get to Brazil. In St. Georges, I had to first find the police station in town to get my exit stamp. Then I had to go down to the riverside and hire a motor canoe to drive me across the muddy waters to Oiapaque, the Brazilian town 5 minutes away. 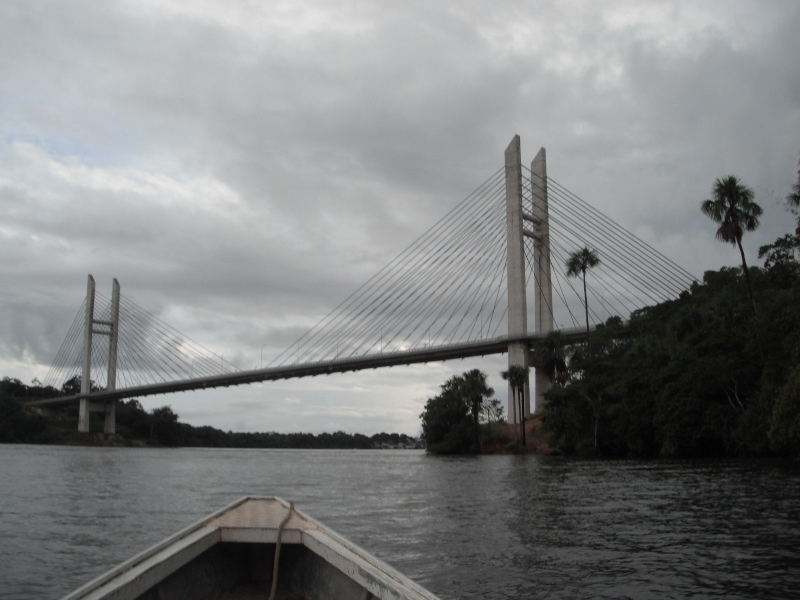 Cecil first showed me the bridge to Brazil, which has been completed for some months now and has an entire staffed border on the French side, but the Brazilian side hasn’t finished their road or built the proper facilities yet, so the bridge remains ucrossed. Once I arrived in Oiapaque, I had to wander a few blocks into town away from the docks to find the Brazilian police station, which makes you wait outside while they take your passport inside and take 15 minutes to examine and stamp it. Then you have to walk back down to the river front, or 4 km further into town, to find a bus to take you overnight to Macapa. There are only a couple daily, leaving between 5 and 6 pm, and take 11 or 12 hours to get to Macapa. I read the road was bumpy and uncomfortable, but even in the very back row, I managed to sleep without hopping around too much. The bus stopped every 4 hours for a toilet break, and each rest stop had free coffee and water. You could pay for a meal by weight, serve-yourself buffet style of whatever tickled your fancy. It was a long, damp ride through the rain forest, but it was never cold until they overdid it with the airconditioning. Once you arrive in Macapa, you have to get to Santa Ana, a town 25 minutes away either by bus or taxi. The docks there are filled with boats that sail up and down the amazon, to remote floating villages and all the way to Belem, an urban city of 2 million. There’s usually a boat every day, leaving in the morning or afternoon, and takes anywhere between 24 – 40 hours. I bought a ticket with Sao Francisco da Paula, which was scheduled to leave at 10 am. It left 30 minutes late, but arrived in Belem exactly 24 hours later – a unexpected surprise when I had been warned the boats usually take atleast 36 hours. We sailed all day and night, at the same, slow speed, with the humming sound of the engine quickly becoming white noise. There were 3 floors – the first, the loudest, with fewest hammocks; the second with hammocks stacked beside and ontop of eachother in every conceivable hanging spot, and the third, a roof top patio and bar where people watched the same music video on repeat the entire 24 hours. I was the only non-portugese speaking person, and only one of three women under 40. The rest were males and families who paid little attention to my strangeness. The staff made sure I knew when meal time was, where I could find free coffee, and approved my hammock spot in a more secluded corner at the back of the boat where I shared the view of the amazon passing under us with only 3 other people. Sometimes the river was narrow, with overhanging trees and lush vegetation seemingly floating alongside us. Other times, it was as wide as a lake, giving you the feeling the Caribbean ocean wasn’t far away. Every few hours, we passed a fisherman or some kids in dugout canoes paddling against our wake, and a wooden house on stilts with some smoke or light peering out of it. I could never see past the density of the trees, or down below the murky surface of the water, so I found myself looking up a lot, at the bright blue sky, the passing clouds, the thick grey clouds pouring down rain on us or over yonder, and finally the star studded sky and shiny moon filling from the wrong side. Since I arrived in Belem 12 hours earlier than I expected, I had the entire day to explore since my flight to Rio wasn’t until 2 am. I had no idea or any clue what to do, and Belem was as big and scary as sailing into Miami Beach from the silent everglades, so I took a taxi to an internet café and searched for a friend on couchsurfing. Within an hour, I was walking past the beautiful Nazarene Basilica on my way to Jorge’s house, where I could shower, drink some acai, and leave my bags. He led me to the old town, past another beautiful church, a fortress, and a rancid port where pigeons had been replaced by vultures and the smell of dead fishy things was overwhelming. But the place was beautiful, and an incredible market started there and went on for many blocks until we reached the new town. There we ran into more couchsurfers, and sat on a patio in the drizzling rain drinking beers and cachaca until my midnight calling to go to the airport sadly arrived.